Learn how to germinate seeds fast and easy today! With this guide, you can now start growing seeds in soil, water, and even common household items like a paper towel! One of the basic skills any homesteader should learn is how to germinate seeds. Once you get the process, you can just imagine the different salad greens, fruits and veggies – even flowers – you can grow! That can save you a lot of money in the future. Of course, you can now feed your family with nutrient-dense, delicious, and even organic whole food. A lot of people tend to think you need to have a green thumb before you can grow seeds. Definitely, it helps, but the truth is anyone can grow food, build a garden, and sprout seeds with these fast and easy ideas. Before we get into the easy ideas on how to germinate seeds, let’s answer one of the common questions among homesteaders: what’s the difference between sprouting and germinating? The answer is none! Yup, technically, they mean the same thing. Recently, however, some refer to microgreens as sprouts. Learning how to germinate seeds fast involves knowing the factors that affect its growth. These include water, light source (sprouts grow toward the light), type of germinated seed, type of soil, and season. Different seeds require different quantities and needs for each of these elements, so doing your research FIRST before you start the process of seed germination is important. Needless to say, this guide will give you the basics. One of the first processes of seed germination is called imbibition. This is when the seeds “drink water.” By imbibing water into the seed, it starts off and even speeds up the metabolic processes need to make the seeds sprout and grow. If you’re starting learning how to germinate seeds in water, you can achieve the best results with an avocado seed (hello, guacamole!). 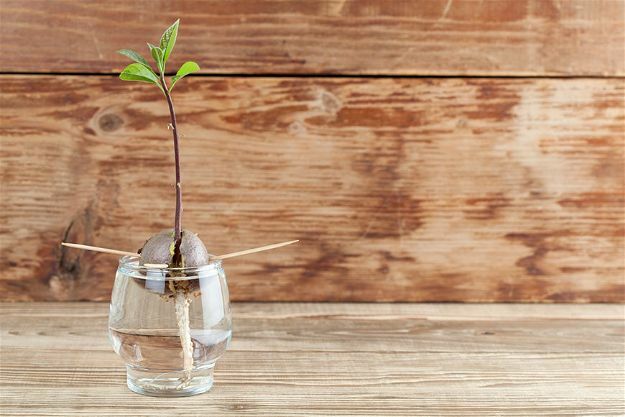 Some seeds need to be soaked in water (this is called pre-soaking) to soften the seed’s coat, but to germinate an avocado seed, there’s no need for that. Rather, you can use a toothpick to balance it in the mouth and allow the roots to grow and feed on the water. If you can germinate seeds in a cup of water, you can also sprout them using a sponge! This is a great idea if you are thinking of having fast-growing seeds. Note, though, since a sponge doesn’t have a lot of space available, you can’t have too many seeds in one. To germinate seeds in a sponge, you need a clean dry sponge. A kitchen sponge will do. Then you have to run it on clean, tepid water. The sponge will soak the water, but it should not be dripping with it. Place the seeds inside the sponge and the sponge onto a clean dish. Check the sponge regularly for any sprouting. A very popular method of sprouting seeds is by using tissue paper or a paper towel. Germinating seeds in a paper towel is a viable option when you have a lot of seeds with you, and you have no idea which of these will grow successfully. How to germinate seeds in a paper towel? So easy! It doesn’t even require sunlight. Get a kitchen paper towel and run it on water. Wring it to remove the excess water and spread the seeds evenly. Cover them with another moist paper towel and put in a dark area to allow the seeds to absorb the water properly. Germinating seeds in soil is remarkably easy, provided you have the right kind of soil (although compost always works). The best part is you can be imaginative and creative by putting them in recyclables! Take, for example, the muffin trays, which are perfect when you are growing different sprouts simultaneously. Plastics don’t decay at least within the next thousand years, so why don’t you recycle those plastics into containers to germinate seeds indoors? You can get plastic containers like these, place the seeds near the window, and allow enough sunlight to let the seeds grow. 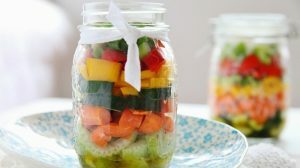 The great thing about mason jars is they tend to be deep, so there’s enough room for the seeds or sprouts to really take root. They also make nice decors for your kitchen counters and windowsills. If you’re planning a birthday or even a wedding, they make awesome party favors. If you’re looking for more room to plant many seeds, then I suggest you get the tin cans. They’re wide and deep you may no longer need to move the plants to pots anymore. I love the look of tin cans as is, but if you want to be artsy, you can spray paint them with bold, lively colors. Can you germinate seeds in CD cases? The answer is yes, although the space is pretty limited. However, it makes an excellent science project as kids can see how the seeds sprout and grow. Wide soup bowls are perfect for growing fruits and veggies that also tend to be huge once they grow like pineapples, for instance. A busybee (yup, pun intended)? Water is an essential element when you’re still trying to germinate seeds. If you don’t have time to water it regularly, you can try doing this simple process. The self-watering technique involves cutting a plastic soda container about two-thirds and a third. Fill the two-thirds container with soil for your seeds while you place water into your one-third container. Put the two-thirds container in your one-third container. That’s it! The roots will consume whatever amount of water it needs, so you add more only when there’s little to none left. One of the main reasons why you should seriously consider sprouting seeds is carton is biodegradability. You don’t have to worry about throwing the cartons away once you’re ready to move the seeds to their pots. If you lack muffin trays, you can grow seeds in egg trays instead. Fill them with soil and spray some water, and you’re good to go. Another option is to use eggshells. Cut them in half, fill them with soil, and add a minuscule amount of water. Then place the eggshells in the tray. I love using toilet paper rolls or cartons to organize my wires, but you can also use them for seed germination. They’re scalable, which means you can add as many toilet rolls as you like in a container depending on how many seeds you wish to sprout. Be a lot gentler on the environment by either composting your fruits and veggies or using them as seed starters. Your pumpkin, for instance, can be used to grow, what else, pumpkin seeds! It takes about a week to see your first sprouts, so they’re easy to germinate. All you need is to get a pumpkin (not rotting yet), cut the top, clean the space, add your compost or soil, bury the seeds, and water. Don’t have pumpkin? More likely, you have citrus fruits like lemons. Use the halves the way you do pumpkins. That’s it! There you have it, my fellow homesteaders! Here are 5 ways on how to germinate seeds the easiest and fastest way possible. Many of the things you need are found in your home, so all you need is some creativity and imagination, and you can make the process even more fun. What are your favorite ways on how to germinate seeds? Do you have some tips as well? We would love to hear how your own seed sprouting process has gone, so tell us in the comments below. If you want more gardening ideas, check out these 33 best hydroponic systems for your homestead!